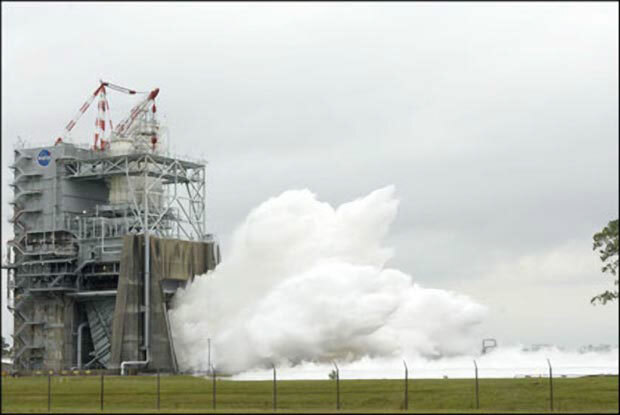 The silence that followed the shake, rattle, and roar of the space shuttle main engine test October 22, 2008 at NASA’s John C. Stennis Space Center in south Mississippi (shown above) signaled more than a successful completion of 520 seconds of high-pressure firing. It also marked the end of an era – certification of the final flight engine (no. 2061) for the nation’s Space Shuttle Program, which is set to end in 2010. 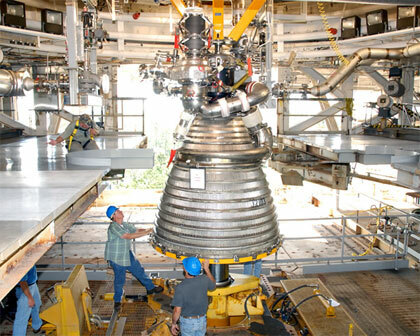 Stennis will continue testing space shuttle main engine components through 2009. Larry Pigott has been involved with the shuttle program since 1981 and approached the final flight engine test with mixed emotions. the last shuttle flight engine to be scheduled for testing at Stennis. Space shuttle main engine 2061 was built by Pratt & Whitney Rocketdyne and delivered from Kennedy Space Center in Florida to Stennis for certification testing earlier this month [October 2008]. Since 1975, every main engine used in the Space Shuttle Program has been certified flight worthy at Stennis. During that time, about 50 main engines have been certified for use on more than 120 shuttle missions. Certified engines can be used to power more than a dozen flights before being recertified, yet no shuttle mission has failed as a result of engine malfunction. At one point, all three test stands at Stennis were involved in shuttle engine testing. Today, testing for the program occurs on the A-2 Test Stand as Stennis engineers prepare for certifying the J2-X engine currently in development. The J2-X engine will help power the Ares I and Ares V rockets that will take humans back to the moon and possibly beyond as part of NASA’s Constellation Program. Core components of the J-2X engine being designed for NASA's Constellation Program were installed on the A-1 Test Stand for testing in early 2008. The Constellation Program grew out of President George W. Bush’s challenge in 2004 to complete the International Space Station, retire the space shuttle in 2010 and build new space vehicles to go back to the moon by 2020. Work is progressing toward those goals. 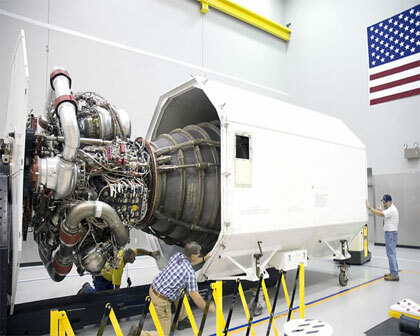 Now proven flight worthy, engine 2061 will be shipped back to Kennedy for installation on an orbiter. It is one of 14 certified flight engines Kennedy will use for the remaining shuttle missions. Meanwhile, engineers at Stennis will return one of two development engines to its A-2 Test Stand to continue component testing for the Space Shuttle Program. NOTE: Project Constellation was cancelled by President Barack Obama on October 11, 2010, but development of the J-2X has continued for its potential as the second stage engine for the new, heavy-lift Space Launch System. The first hot-fire test of the J-2X was scheduled for late June, 2011. On November 9, 2011, NASA conducted a successful firing of the J-2X engine of 499.97 seconds in duration.